The robotic 'bio-bat' demonstrates self-contained autonomous flight by mimicking morphological properties of flexible bat wings. Credit: Cover photo, reprinted with permission from AAAS. "Our work demonstrates one of the most advanced designs to date of a self-contained flapping-winged aerial robot with bat morphology that is able to perform autonomous flight," explained Alireza Ramezani, a postdoctoral researcher at the University of Illinois who is the first author of the cover article, "A Biomimetic Robotic Platform to Study Flight Specializations of Bats," appearing in Science Robotics on February 1. "It weighs only 93 grams, with dynamic wing articulations and wing conformations similar to those of biological bats." "The B2 possesses a number of practical advantages over other aerial robots, such as quadrotors," said Chung. "Bats do have more 40 active and passive joints; we reduced those numbers to 9 (5 active and 4 passive) joints in the B2 robot. The compliant wings of a bat-like flapping robot flapping at lower frequencies (7-10 Hz vs. 100-300 Hz of quadrotors) are inherently safe: because their wings comprise primarily flexible materials and are able to collide with one another, or with obstacles in their environment, with little or no damage." "Our flight control results are the first demonstration of using asymmetric wing folding of the main flexible wings to control the heading of the aerial robot," Ramezani added. "Its morphing property cannot be realized with conventional fabrics (such as nylon or mylar) that are primarily used in flapping wing research. Non-stretchable materials resist the forelimb and leg movements in B2. 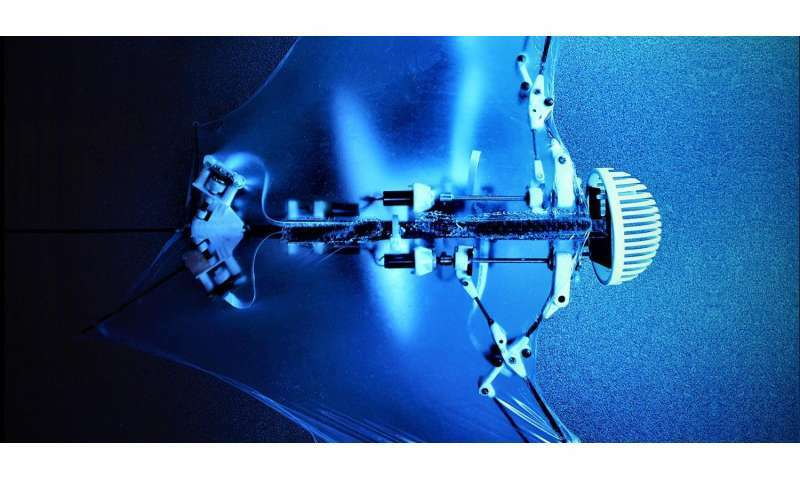 As a result, we covered the skeleton of our robot with a custom-made, ultra-thin (56 micron, silicone-based membrane that is designed to match the elastic properties of biological bats' membranes." "For example, for tasks that require the aerial robots to be stationary, our bat-inspired aerial robots will eventually be able to perch, instead of hovering, by taking advantage of unique structures in construction sites such as steel frames, side walls, and ceiling frames," Chung said. "This is a more energy-efficient and reliable solution since stationary hovering is difficult for quadrotors in the presence of even mild wind—which is common for construction sites. Furthermore, perching or landing conventional aircraft and quadrotors in such unusual places is nearly impossible, due to their limited control authority at slow motor speeds and aerodynamic couplings such as wall or ground effects." "In addition to construction applications, we envision robotic flapping-wing robots operating in tight quarters with humans and beyond where humans can go," Chung noted. For example, an aerial robot equipped with a radiation detector, 3D camera system, and temperature and humidity sensors could inspect something like the Fukushima nuclear reactors, where the radiation level is too high for humans, or fly into tight crawlspaces such as mines or collapsed buildings. Such highly maneuverable aerial robots, with longer flight endurance, will also make advances in the monitoring and recovery of critical infrastructures such as nuclear reactors, power grids, bridges, and borders. "Finally, this robot can contribute to biological studies on bat flight," Hutchinson added. "The existing methods for biology rely on vision-based motion capture systems that utilize high speed imaging sensors to record the trajectory of joints and limbs during bat flight. Although these approaches can effectively analyze the joint kinematics of bat wings in flight, they cannot help understand how specific wing movement patterns contribute to a particular flight maneuver of a bat. B2 can be used to reconstruct flight maneuvers of bats by applying wing movement patterns observed in bat flight, thereby helping us understand the role of the dominant degrees of freedom of bats."